Welcome to another post in the category of posts entitled, ‘SERMON SUNDAY.’ Lord willing, at least a few times a month I will share a sermon with you by a well respected preacher who focuses on an important truth in Scripture in order to awaken the slumbering church, and also to alert Christians to the importance of reading and studying God’s Word. It may be a short sermon in written form, or I may present something to you in video form. I pray that when time allows, you will take the time to read or to listen to what I will be sharing with you. I will also be sharing some expository preaching with you, but sadly, that is a very rare thing to find these days. I’m sure that many of you can attest to that undeniable fact. Sadly, many pastors today who seek to grow their churches oftentimes resort to distorting God’s Word either by taking a verse out of context, or by interjecting their own ideas into the text to make it say what they want a verse of Scripture to say (eisegesis). Sometimes a pastor will even go as far as to manipulate Scriptures in such a way so that they can preach about themselves (narcissistic eisegesis). Then there are some pastors who just present watered down messages with very little Biblical content, and others who ‘preach’ controversial messages that will appeal to today’s culture in order to attract more people. Sadly they will continue ‘preaching’ these types of messages in order to entertain the crowd to keep them coming, rather than preaching God’s Word as they are instructed to do in order to feed and equip the sheep/saints and to expose the sin in men’s hearts so that God will grant them repentance and lead them to a knowledge of the truth. For those who somehow find there way here, I hope and pray that you will be blessed and encouraged by the many Biblical teachings that I will be sharing with you in the weeks and months ahead –Lord willing. Thank you very much for stopping by and taking time out of your relaxing weekend (at least I hope that it has been so far) to read some of my posts and poems. I found and quick captured the beautiful picture above on KingJamesBible.org page on Facebook. Joy, peace, confusion, fear, and anger. These were the emotions I deeply experienced and quickly moved through as I discovered the true gospel while reading the Catholic New Testament Bible that I received from my ‘husband’ in 1980. Because, as time went on, the truth of God’s Word began to peel back the layers of man-made traditions and expose the false doctrines that cloaked the glorious reality of who Jesus truly is and what He actually accomplished through His sinless life, His atoning death, and His miraculous resurrection from the dead. Even though the truth that I found in God’s Word began to fill me with a deep sense of joy, seeing the truth also made me realize that I had been lied to and deceived by the teachings of Catholicism. It took some time to deal with the anger, but by the grace of God, around a year or so later, after spending a lot of time reading God’s Word on a daily basis, I finally came to the point of having a faith that was firmly established on Jesus Christ as my solid foundation; the day finally came when I was no longer ‘tossed to and fro by every shifting wind of the teaching of deceitful men.’ (Ephesians 4:13,14) God used that time in my life to make me realize the importance of searching the Scriptures and studying them and testing the words of men (and women who claim to speak for God), against the truth of God’s Word (Acts 17:11) so that I would never be deceived again! Little did I know at that point in time, that in the years to come, I would be leaving other churches, as well. Not only because of unbiblical teachings, but also because of a pastor who would make wrong relationship choices which would cause him to drift slowly, yet steadily, away from the strong stand he once had for Biblical truth. While reading that passage of Scripture, “God gave me complete assurance of my salvation and removed the final traces of fear and doubt” once and for all! As I began to read God’s Word, God began to open my eyes so that I could not only see the richness and the beauty of the truth that was in His Word, but also He made me realize that much of what I learned as a Catholic was either nowhere to be found in Scripture, or the teachings of the Catholic church did not line up with what God’s Word was saying. That’s when the confusion began to set in, which was actually the beginning of the light of His truth shining into my spiritual darkness and exposing the traditions of men and some of the false teachings of the Catholic church. Around 8 years ago while watching *Mark Woodman’s YouTube video, ‘Poison in the Passion of the Christ,‘ *(He died a few years ago, and I recently found out that he was part of the Seventh Day Adventist cult, so I do not endorse him at all, but I found the information in his video very revealing) I learned that the actual inspiration behind some of ‘The Stations of the Cross’ as well as Mel Gibson’s ‘PASSION OF THE CHRIST‘ movie, was partially based on ‘visions’ that a woman mystic named Anne Catherine Emerich supposedly had, which explains why I was not able to find those things in the Bible! Note in the quick capture below, that ‘indulgences (a shortening of the amount of time that a person would have to spend after death in the ‘purging’ fires of a place the Roman Catholic church calls ‘purgatory’ “in order to undergo purification, so as to achieve the holiness necessary to enter the joy of heaven.” CCC 1030) will be granted to a person who chooses to pray at each of the Stations of the Cross.’ This would mean that a person’s time in ‘purgatory’ would be shortened if they would walk up to each station, (which is a sculpted picture or painting representing some of what Jesus endured the day He died), and take time to reflect on each part of Christ’s journey to the cross, saying certain prayers at each station, as well. This practice may sound good, and it may seem very meaningful to reflect on what Jesus endured on our behalf, but when one realizes that portions of what is said to have happened during Christ’s journey to the cross is based on false visions of a mystic and proves to be unbiblical, as well as the fact that images are also unbiblical according to God’s Word (Exodus 20:4-6, Deut.4:23-25, ), it then becomes very clear that this is not honoring to God in any way! 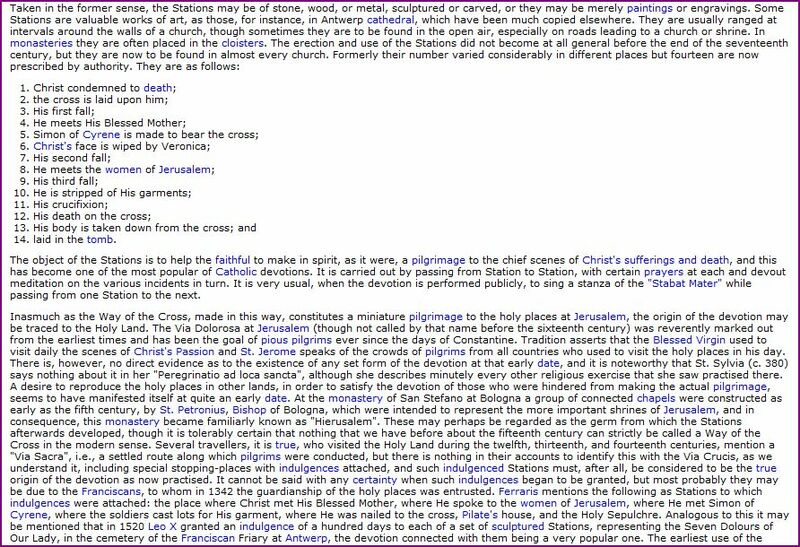 Note also in the final sentences in the quick capture below, that “…in the year 1520, Pope Leo X granted an indulgence of 100 days to anyone who would do each of a set of sculptured stations representing the “Seven Dolours (Sorrows) of Our Lady.” Not only are indulgences unbiblical, because they clearly imply Jesus’ death was not sufficient to pay the debt for our sins in full, but also once again you can see how the teachings of Catholicism turns the attention of their people to Mary when our focus should be on Jesus Christ alone. 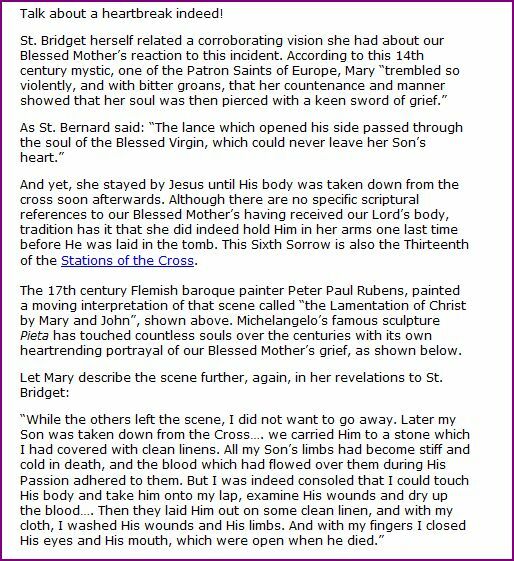 Upon doing research on this, on Sunday, 11/16/14, I found the following disturbing information to reveal where this idea of ‘Mary receiving the dead body of Jesus‘ actually came from! Here is a small portion of that information that you can also read in greater detail further below, and you can also read the entire article by clicking on the word ‘SOURCE‘ under the information I quick captured below. “Consider these words from St. Alphonsus Liguori as he quotes another religious figure: “If you desire, O children of Mary, to find a place in the heart of Jesus, without fear of being rejected…go with Mary; for she will obtain the grace for you.” (Emphasis in red is mine). “Both Scripture and Tradition must be accepted and honored with equal sentiments of devotion and reverence.” (Emphasis in red is mine). 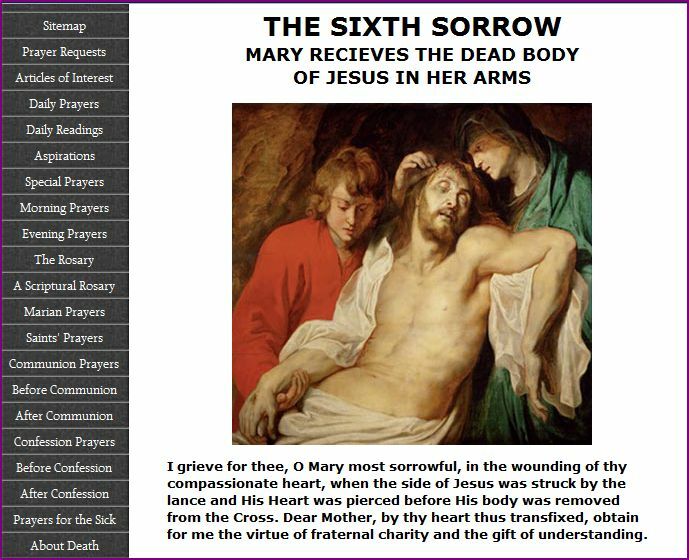 Whether intentionally or not, placing the emphasis on the sufferings of Mary that are revealed through these unbiblical revelations, seems to indicate Catholicism’s plan — a plan that has been in progress for many years now — working towards proclaiming Mary as Co-redemptrix supposedly at her request! “First of all, she is the Co-redemptrix…” “The doctrine means that Mary participated with Jesus and under Jesus in a way unparallelled; in a unique fashion in all of human history that, as a woman was part of the process of the fall of the human race — the role of Eve with Adam — so God willed that a woman would be part of the process of the restoration of grace with Jesus, the new Adam. This is Mary the Co-redemptrix. 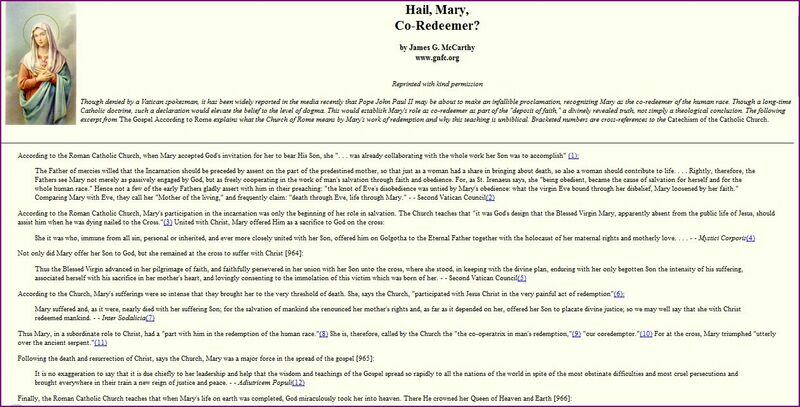 So when the church calls Mary Co-redemptrix as blessed John Paul II did, for example in 6 occasions, it means specifically that Mary uniquely collaborated, participated, cooperated with and under Jesus for the redemption of the world.” (Emphasis in red is mine). 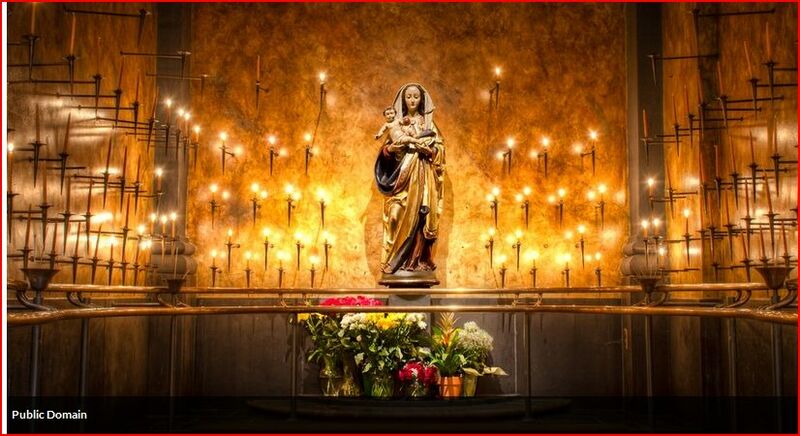 If you have never seen the following disturbing, yet very informative video before, when time allows please watch and listen to these supposed messages given by these apparitions who all claim to be the Virgin Mary. Please be sure to test the messages in light of Scripture. 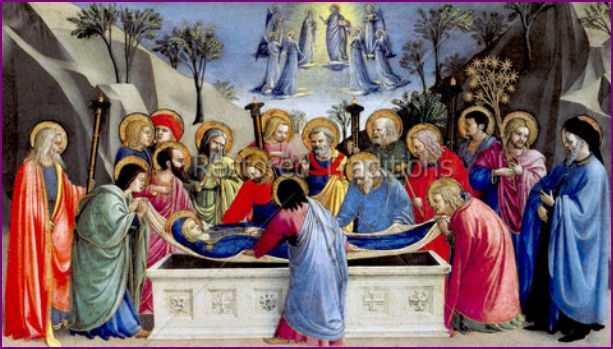 CATHOLICISM TEACHES: Mary did not die but was assumed into heaven, body and soul. CATHOLICISM TEACHES: We go to a place called ‘purgatory’ after we die to burn in a purifying fire for an unknown amount of time before we are allowed to enter heaven (based on 2 Maccabees 12:38-46, a non-canonical book rejected by Protestants and Jews, and Matthew 5:26 which is a distortion of Scripture). After Catholics confess their sins to the priest, they are told to do “penance,” for their sins, which means they have to say specific prayers a certain number of times as determined by the priest when he ‘absolves Catholics from their sins with the power priests claim they have been given by Jesus Christ.’ However, when I first began to read the Catholic New Testament given to me by my ‘husband,’ I never found the word ‘penance.’ Instead I found the proper and accurate word ‘repent,’ which means ‘to change your mind;’ ‘agree with God that you have sinned and turn from your sin and turn to God.’ In my family’s Douay Rheims Catholic Bible, however, the word penance is used instead of repent. If you click HERE you can read a list of all the verses where penance is used in place of repent. Please be sure to watch the videos I posted because they are filled with a lot of good information that goes into detail concerning some of the things I mentioned in this post. When time allows, please consider clicking on the links to many of the good articles that I posted below, as well. It was March of 1980 right before Easter/Resurrection Sunday. I was still attending the Catholic church on Saturday evenings and would then attend the Assembly of God church with my friend on Sunday mornings. When I made a commitment to Jesus Christ and to believe God’s Word, the Bible, over man’s word, Catholicism, I decided to be baptized again to show I was following Jesus of my own free will and leaving the old Mary with all of her sins nailed to the cross and buried in the waters of baptism, and that I was emerging out of the waters as a new creation in Christ. (Colossians 2:8-15, 1 Peter 3:21,22, 2 Corinthians 5:17) None of my family came to see me, but my church family was there praising God for revealing the gospel to me and giving me eyes to see the truth and setting me free. At that point in time my daughter was in Kindergarten in the public school just two blocks from our home. Just a few months before I had placed my complete trust in Jesus and came to realize and believe that He paid the debt for my sins in full and chose from that point on to believe God’s Word over the teachings of Catholicism, I had already made the decision to enroll my daughter in the Catholic school near our home for the following year because I wanted her to learn about God. She did attend Catholic school the next year as I continued my research into the teachings of Catholicism and compared everything against God’s Word, the Bible. Throughout that year I made the most of the time while she was there by giving her teacher (who was a nun) a New Testament Bible (that had the plan of salvation and a list of questions in the front of it) as a Christmas gift, and I shared the gospel with her, as well as with some mothers of my daughter’s friends that I met that year. However, when I finally came to the point of clearly realizing that many teachings of Catholicism were false, and knowing the following year that my daughter would begin having Catholic Catechism classes to prepare her to receive her ‘First Holy Communion,‘ I decided to pull her out of the Catholic school at the end of the school year to protect her from being indoctrinated, confused, and deceived, and I enrolled her back into the public school down the street for Second Grade. I understood why she was angry, but her words and rejection still hurt me deeply. Probably as deeply as it hurt her to hear me share with her that I had left the Catholic church. But I knew I had to take a stand for the truth of God’s Word –no matter what the cost —*as you will soon see a little later in this post. The more I learned about what the Catholic church actually teaches as I continued to do research, the angrier I became because of all the lies and deception within this religion that I was a part of for so many years and believed to be true for so long with all of my heart! That anger began to gush out of me one day during a conversation I was having with my neighbor, who was also a Catholic, and who was the mother of one of my daughter’s friends. She had asked me ‘why I took my daughter out of Catholic school and enrolled her back into the public school again.’ I wanted to ‘make the most of that opportunity,’ so I calmly began to tell her about what I was learning while reading the little Catholic New Testament Bible that my ‘husband,’ gave me and how I didn’t want my daughter to learn about some of the false teachings of the Catholic church, such as ‘purgatory.’ She replied simply by saying, “Oh purgatory. They don’t teach that any more.” I didn’t direct my anger at her, but I was utterly shocked at what she said and how she had said it in just a matter-of-fact way as if it didn’t bother her in the least bit! I replied to her filled with a righteous anger thinking of the many Catholics who have been deceived by this teaching by saying, “They don’t teach that any more?!! Then what about all the Catholics who pay for masses to be said to get their loved ones out of purgatory? ?” I forgot what she said in reply because it happened so many years ago, and I don’t have the time to search through all my journals to try and find that actual day and what I wrote concerning all that was said that day, but I do remember that it didn’t turn into an argument. Because of another certain incident that happened shortly after becoming a Christian, God strongly convicted me of the attitude I was beginning to have concerning Catholicism. It happened during a women’s Bible study when I expressed my anger concerning the false teachings of the Catholic church in a sarcastic way not knowing that one of the new women who was attending our women’s Bible study that day was a Catholic. She never came back, and I found out it was because of what I had said. I can’t remember what it was that I actually said, but I do remember that I felt horrible when I found out the reason she didn’t return was because of what I had said that day!! From that point on, instead of having anger, I began to develop a deeper compassion for Catholics, and to this day I am very conscious of what I say when I am with a group of people that I don’t know; I use my words very carefully so as not to offend any Catholic, or anyone who may hear me speak out of a righteous anger concerning Catholicism, or whatever the subject may be. My ‘husband’ saw me change from being a very fearful and depressed young woman before I became a Christian (mainly because of his behavior, and because of how he was treating me since the day we were married), to a young woman who was now filled with God’s peace and joy and who also had His strength and courage to now face many of my fears and to stand up to him; God not only gave me eyes to see through his manipulative schemes, but He also gave me courage to confront him, when necessary, in a firm, but loving manner. My ‘husband’ also saw me change from a young woman, who, just a few years earlier, wanted to find a Catholic church to attend by our newly purchased home that had statues, (one other Catholic church we attended near our new home didn’t have any statues) to just a few years later now leaving the Catholic church because they had statues, and for many even more serious reasons, as well. In spite of all the significant changes I made in our home and in my appearance, he made it very clear to me one day by what he said that he liked the new and more courageous and no longer fearful Mary even less than the Mary I once was. He pointed out some of the facts: The new Mary no longer drank at parties and social occasions like weddings. The new Mary shared the gospel with all of his friends whenever an opportunity presented itself. He began to distance himself even further from me, even to the point of suggesting one day that I sleep in my son’s room because my son would sometimes wake up in the middle of the night and crawl in bed with us when he was around three years old. I refused to take him up on his suggestion and from that point on I felt an even deeper level of his rejection. “I began to feel very sad and hurt and came out in the front room and sat on the couch and Horace went up in our bedroom and then came down again and finally came out to me and I knew that we were about to have another talk. Horace began by asking me what I was thinking. I swallowed to gain some strength and said through tears, “I wish this was just a dream. I am trying to be strong, but I am also human, and I hurt! Horace said something like, “I just have to go away for a while to get myself together, and I think deep down you know that’s what I need.” Horace sat down to my left on the couch and said, “I would like to see the kids as much as possible.” I began to cry at this because it hurts so much to think he just wants to see them and not me and Horace asked why I was crying and I told him, “I wish that you wanted to see me as much, too.” Horace said, “I love you. I just wish you were the same one that I fell in love with.” When he said that, two tears fell from his left eye, and the battle began. Satan tried to blame this all on me because of me being a Christian. Horace went on and on saying, “They got a hold of your mind and they have you trained to think the way they want you to think.” As he said this, and other things to come, I silently cried and shook my head (no) as the tears dropped from the outer corner of my left eye and fell upon my vest and pillow on the couch. The verse, “Blessed are those who are persecuted because of Me…” went through my mind as I also prayed in the Spirit to fight what was coming against me. “God, please make him understand,” I said within me. I refused to receive any of this. Then we were both quiet, and Horace asked, “What are you thinking?” I said, “I want you to understand me.” Horace said, “I do too.” I said, “No matter what you think, I am not brainwashed; I have my own free mind, and I chose to change my life.” The Horace said, “Yeah, my friends say, ‘Try to change Mary.’ And I told them, ‘She’ll never change; she wants to be this way.” Horace said, “You won’t change…will you?” I shook my head ‘no’ as tears came streaming down my face. But in my heart, as Satan was trying to destroy me by telling me ‘my Christianity is destroying my marriage,’ the Holy Spirit comforted me with the thought that if Horace’s only argument why this marriage can’t work is because of me being a Christian, I know God will bring Horace to understand and to accept Jesus and truly make us one. He went upstairs and began to pack and I had to go walk away because it was too heartbreaking for me to watch. I went downstairs in the family room and opened my Bible and God spoke to me through His Word to confirm what He had brought to my mind during my conversation with Horace; my Bible opened to this verse: “Blessed are you when people insult you; persecute you and falsely say all kinds of evil against you because of Me. Rejoice and be glad, because great is your reward in heaven…” (Matthew 5:11) I said out loud, softly, “Oh God, You are so close!” I just felt He was so close when He gave me that Scripture and realized that He is right with me. Horace came downstairs and he hugged me again, and as we began to walk up the stairs he said something that really carried me through this rough day. He looked at me with tears in his eyes and said, “I know this might sound strange coming from me, but…keep the faith.” I was so touched! He had a look on his face like he admired my strength and believed I found the truth, but that he was confused and torn both ways. I think he wanted me never to stop believing and praying for him, either. I hugged him tightly and said, “Oh, hon, I will never stop loving you and never stop praying for you. And don’t forget, Satan is a liar and God loves you and will forgive you no matter what, and so will I.” Horace answered by saying, “Don’t preach at me.” I couldn’t tell if he was angry or said it lightly, but I felt really led to say that to him. (His aunt had died on October 3rd, and tonight, October 5th, was the wake). Horace asked me if I wanted to go to the wake with him. In spite of how sad and devastated I felt, I told him ‘yes,’ and that ‘I wanted to be strong in front of his family.’ He said, “Well, we won’t stay long.” I prayed every possible way while he drove so that I wouldn’t feel any guilt that I had failed to pray a certain way that I might think of later after he left us. Horace had asked me if we should tell his family that he was leaving, and I told him ‘no.’ (‘Love covers all things’ was my reason for not making him tell his family, but later I wondered if I should have made him tell them so that he would have had to deal with the choice he had made). I told him that I might just tell Myrtle (one of his sisters whom I was very close to…not her real name). I did talk to Myrtle, and she agreed that Horace was using my ‘religion’ as an excuse. She also said, “When he’s on his own for a while that he’ll realize it not all that great.” While we were there God gave me strength and peace just to sit and to talk to everyone, and I told Myrtle not to tell anyone and she agreed. She hugged me and said to call her if I needed to talk or anything. The ride home was the beginning of the hardest moment of my life! I prayed that God would open Horace’s eyes and ears to see the world as it really is. I prayed that the convicting power of the Holy Spirit would be with Horace stronger than ever before. I especially prayed that God would not let him go unless it was God’s will that he go; only if it was the path that would lead Horace to Him. I prayed for God to hold back all the powers of hell from interfering with His will so that whatever happened I would have God’s peace because I totally prayed every way I knew how and I wouldn’t feel it was my fault in any way because of a lack of prayer. My heart broke in two as he said ‘good-bye.’ How I wanted to run after him and say, “Please don’t leave! I love you!” I wanted to scream and run and hug him, and hold him, and never let him go! I thought of him watching his own dad leave him and how he must have wanted his dad to come back! I wanted to fulfill his dream by stopping him from doing the very same thing! My heart broke with compassion for him thinking how he’s searching for the very thing that I have right here…Jesus! But I have to believe, as devastating as it may be to me, that what Satan is using for evil, God will somehow use for good, and that this will be the road on which leads Horace to Him! I watched through tear-filled eyes as he drove away, but had a peace knowing that this was God’s will. After the kids were in bed I got ready for bed and prayed some more and cried some more, and went to bed. I tossed and turned all night looking at the clock and wondering when he’d come back, and praying in the Spirit as I laid my hand on his pillow. With tissues in hand, I followed Horace down the stairs to be with him as he faced the thing he dreaded the most. Horace still had tears in his eyes and spoke quietly to keep from breaking down and crying. Horace said to the kids as they were sitting on the couch, “Come here.” They both knew something was wrong and they both stood up, sad and silent. I said calmly, “Come on. Let’s all go and sit on the couch.” They both sat down by Horace and he put his arms around them and said, “Daddy loves you both very much. And you are both very special, and I want you never to forget that.” Then he said to our daughter, Penny (not her real name) “Remember, honey, what we talked about before?” (I had no idea that he had been talking to them about leaving). She quietly and sadly said, “Yeah.” He continued…”Well, daddy needs to go away for a little while to think about things. He just needs some time to get away by himself and think. But I’ll call you every day, and, Peter… (our son…not his real name) I’ll still take you to your ‘Dad and Me’ class. I love you both and I love your mom too, but I just need some time away. Your mom loves you both too, and she’s going to need you both very much. I cried quietly when I heard him say all of this to the kids. I was getting so angry at Satan. Then the kids started to cry and Peter put his head into his pillow and Horace stood up to walk away, and the kids stood up and he put his arm around all of us and said, “I love you all!” He cried, and we all cried together. I was filled mostly with compassion for Horace, but also with a little anger. If he loves us so much, why doesn’t he try and make things work instead of running away? Then I began to wonder.”How could this be happening?” Horace walked out and I burst out crying as he closed the kitchen door and drove away. I pounded the kitchen doorway by the dining room and sobbed uncontrollably. Then I held the kids and we all cried together as we watched him drive away. I held them and began to pray for God to show him the truth and for His Holy Spirit to convict him and to comfort us. In the midst of all the pain and heartache, there were many precious moments with my children like that. Through all the years I waited, I hurt so deeply for my children –even deeper than the personal pain I experienced. I watched my children endure heart-wrenching hurt and disappointment when their dad decided not to come on days when he told them that he would. No child should ever have to go through what they did, but sadly, many children do. And, sadly, many other children never even see their fathers again when they choose to walk out the door! Needless to say, I was deeply hurt that he chose to leave us, and that over the previous two days he had treated me the way he should have treated me throughout our marriage; with love and tenderness, even though it was not genuine. How deeply sad and how horribly ironic to see what it took in order to actually have a deep conversation with him as well as to receive some form of affection that I had desired for so many years! After my ‘husband’ left, it was by the grace of God alone that I was able to take one day at a time. I fought very hard to keep my thoughts under control so that sorrow and hurt would not rob me from enjoying each moment with my children. I also took on many different baby sitting jobs in the years to come so that I could stay home with my children and make them feel as secure as possible. I took turns being ‘room mother’ for both of my children’s school parties and field trips, and went to their schools to see them in plays and music recitals, and enjoyed every minute of it all! During those years we rode bikes together, roller skated together, went paddle boating, went to Great America, and played miniature golf together. I enjoyed playing Barbies with my daughter, and pitching balls to my son in the field. I endured standing outside on cold days just so that I could watch my son play basketball and do tricks on his skateboard, and play on the football team. I stayed up until 2:00a.m. or 3:00 a.m. listening to my daughter share stories of her adventures with her friends when she’d come home. Knowing the day would come all too soon when she would go off to college, as tired as I was, I just deeply appreciated the fact that she shared her thoughts with me. Those days were bittersweet, but I have many memories of the time I spent with my children that I will treasure forever. All because I chose to surrender all the hurt and rejection and fears of what tomorrow would bring to Him, and in return God gave me His grace that was sufficient and His strength that was made perfect in my weakness. Days turned into months, and months into years, and he still did not return home. He called every day and took my daughter and son out at least twice a week, and I appreciated the fact that he was faithful to pay all the bills –most of the time. There were two or three times when the electricity was shut off because he failed to pay the bill on time, and we were cold and in the dark for at least two or three days. In spite all the heartache and turmoil I went through in the years that followed, I continued to pray and believe that the day would truly come when my ‘husband’ would receive God’s love and forgiveness and ask for our forgiveness and return home. I even saved up for a massaging, reclining chair and purchased it and kept it covered in plastic awaiting the day that he would return home. Three different Christian women at three separate times told me that God showed them that my husband was going to return home, and one friend even said she had a vision of Horace sitting in his new chair with my children joyously running around in circles wearing robes of righteousness. I never placed my faith in the words of men (or women, in this case), but only in the Word of God; if I had, my faith might have been shattered by what was soon to come. Time does not permit me to share all of the ANATHEMAS of the ‘CANONS AND DECREES OF THE COUNCIL OF TRENT’ with you, but I listed many of them. If you’d like to read them all, you can do so by clicking on ‘SOURCE’ at the end of this section. Etymology: Late Latin anathemat-, anathema, from Greek, thing devoted to evil, curse, from anatithenai to set up, to dedicate, from ana- + tithenai to place, set. ON THEE FRUIT OF JUSTIFICATION, THAT IS, ON THE MERIT OF GOOD WORKS AND ON THE MARNIER OF THAT SAME MERIT. –CANON XVIII If anyone shall say, that the commandments are, even for a man that is justified and constituted in grace, impossible to keep; let him be anathema. –CANON XXIV If any one shall say, that the justice received is not preserved, and also increased in the sight of God through good works; but that the said works are merely the fruits and signs of justification received, but not a cause of the increase thereof; let him be anathema. –CANON XXIX If any one shall say, that he, who has fallen after baptism, is not able by the grace of God to rise again; or, that he is able indeed to recover the justice lost, but by faith alone, without the sacrament of penance, contrary to what the holy Roman and universal Church, instructed by Christ and his apostles, has hitherto professed, observed and taught; let him be anathema. –CANON IV. If any one shall say, that the sacraments of the New Law are not necessary unto salvation, but superfluous , and that without them, and without the desire thereof, men, through faith alone, obtain of God the grace of justification; though all [the sacraments] be not necessary for every individual; let him be anathema. –CANON VIII. If any one shall say, that by the said sacraments of the New Law grace is not conferred through the act performed, but that faith alone in the divine promise suffices for obtaining grace; let him be anathema. –CANON X. If any one shall say, that all Christians have power to administer the word, and all the sacraments; let him be anathema. –CANON V. If any one shall say, that baptism is free, that is, not necessary unto salvation; let him be anathema. –CANON VII. If any one shall say, that the baptized are, by baptism itself, made debtors but to faith only, and not to the observance of the whole law of Christ; let him be anathema. –CANON XIII. If any one shall say, that infants, for that they have not actual faith, are not, after having received baptism, to be reckoned amongst the faithful, and that, for this reason, they are to be rebaptized, when they have arrived at years of discretion; or, that it is better that the baptism of such be omitted, than that they, while not believing by their own act, should be baptized in the faith alone of the Church; let him be anathema. On the Excellency of the most Holy Eucharist above the rest Of The Sacraments. –CANON I. If any one shall deny, that, in the sacrament of the most holy Eucharist, are verily, really, and substantially contained the body and blood, together with the soul and divinity, of our Lord Jesus Christ, and consequently the whole Christ; but shall say that He is only therein as in a sign, or in figure, or virtue; let him be anathema. –CANON II. If any one shall say, that, in the sacred and holy sacrament of the Eucharist, the substance of the bread and wine remains conjointly with the body and blood of our Lord Jesus Christ, and shall deny that wonderful and singular conversion of the whole substance of the bread into the Body, and of the whole substance of the wine into the Blood, the species only of the bread and wine remaining which conversion indeed the Catholic Church most aptly calls Transubstantiation; let him be anathema. –CANON III. If any one shall deny, that, in the venerable sacrament of the Eucharist, the whole Christ is contained under each species, and under every part of each species, when separated; let him be anathema. –CANON IV. If any one shall say, that, after the consecration is completed, the body and blood of our Lord Jesus Christ are not in the admirable sacrament of the Eucharist, but are there only during the use, whilst it is being taken, and not either before or after; and that, in the hosts, or consecrated particles, which after communion are reserved or remain, the true body of the Lord remaineth not; let him be anathema. –CANON VI. If any one shall say, that in the holy sacrament of the Eucharist, Christ, the only begotten Son of God, is not to be adored with even the worship external of latria, and is, consequently, neither to be venerated with a festive celebration, nor to be solemnly borne about in processions, according to the laudable and universal rite and custom of the holy Church; or, is not to be proposed publicly to the people to be worshiped , and that the worshipers thereof are idolaters; let him be anathema. –CANON VIII. If any one shall say, that Christ, presented in the Eucharist, is eaten spiritually only, and not also sacramentally and really; let him be anathema. –CANON IX. If any one shall deny, that all and each of Christ’s faithful of both sexes are bound, when they have attained to years of discretion, to communicate every year, at least at Easter, in accordance with the precept of Holy Mother Church; let him be anathema. –CANON XI. If any one shall say, that faith alone is a sufficient preparation for receiving the sacrament of the most holy Eucharist; let him be anathema. –CANON I. If any one shall say, that in the Catholic Church penance is not truly and properly a sacrament, instituted by Christ our Lord for reconciling the faithful unto God, as often as they fall into sin after baptism; let him be anathema. –CANON II. If any one, confounding the sacraments, shall say, that baptism is itself the sacrament of Penance, as though these two sacraments were not distinct, and that therefore penance is not rightly called a second plank after shipwreck; let him be anathema. –CANON III. If any one shall say, that those words of the Lord the Saviour, Receive ye the Holy Ghost, whose sins ye shall remit, they are remitted unto them, and whose sins ye shall retain, they are retained are not to be understood of the power of remitting and of retaining sins in the sacrament of Penance, as the Catholic Church has always from the beginning understood them; but wrests them, contrary to the institution of this sacrament, to the power of preaching the Gospel; let him be anathema. –CANON VI. If any one shall deny, either that sacramental confession was instituted, or is necessary unto salvation, of divine right; or shall say, that the manner of confessing secretly to a priest alone, which the Catholic Church hath ever observed from the beginning, and doth observe, is alien from the institution and command of Christ, and is an human invention; let him be anathema. –CANON X. If any one shall say, that priests, who are in deadly sin, have not the power of binding and of loosing; or, that not priests alone are the ministers of absolution, but that unto all and each of the faithful of Christ it is said: Whatsoever ye shall bind upon earth, shall be bound also in heaven; and whatsoever ye shall loose upon earth, shall be loosed also in heaven [ ] and whose sins ye shall remit, they shall be remitted unto them; and whose sins ye shall retain, they are retained by virtue of which words every one is able to absolve sins, to wit, public [sins] by rebuke only; provided the person rebuked yield thereto, and secret [sins] by a voluntary confession; let him be anathema. –CANON XII. If any one shall say, that the whole punishment is always remitted by God, together with the guilt, and that the satisfaction of penitents is no other than the faith whereby they learn that Christ hath made satisfaction for them; let him be anathema. –CANON XIII. If any one shall say, that satisfaction for sins, as regards to their temporal punishment, is in no wise made to God, through the merits of Christ, by the punishments inflicted by Him, and patiently borne, or by those enjoined by the priest, nor even by those voluntarily undertaken, as by fastings, prayers, almsgivings, or by other works also of piety; and that, therefore, the best penance is merely a new life; let him be anathema. –CANON I. If any one shall say, that in the mass a true and proper sacrifice is not offered to God; or, that to be offered is nothing else but that Christ is given unto us to eat; let him be anathema. –CANON II. If any one shall say, that by those words, Do this in remembrance of me, Christ did not institute the apostles priests; or, did not ordain that they, and other priests, should offer His own body and blood; let him be anathema. –CANON III. If any one shall say, that the sacrifice of the mass is only a sacrifice of praise and of thanksgiving; or, that it is a bare commemoration of the sacrifice offered on the cross, but not a propitiatory sacrifice; or, that it avails him only who receiveth; and that it ought not to be offered for the living and the dead for sins, punishments, satisfactions, and other necessities; let him be anathema. –CANON IV. If any one shall say, that, by the sacrifice of the mass, a blasphemy is thrown upon the most holy sacrifice of Christ offered on the cross; or, that it is thereby derogated from; let him be anathema. –CANON V. If any one shall say, that it is an imposture to celebrate masses in honour of the saints, and for obtaining their intercession with God, as the Church intends; let him be anathema. –CANON VI. If any one shall say, that the canon of the mass contains errors, and is therefore to be abrogated; let him be anathema. –CANON I. If any one shall say, that there is not in the New Testament a visible and external priesthood: or that there is not any power of consecrating and offering the true body and blood of the Lord, and of remitting and retaining sins; but only an office and bare ministry of preaching the Gospel; or that those who do not preach are not priests at all; let him be anathema. —CANON II. If any one shall say, that, beside the priesthood, there are not in the Catholic Church, other orders, both greater and lesser, by which, as by certain steps, advance is made unto the priesthood; let him be anathema. –CANON III. If any one shall say, that orders, or sacred ordination , is not truly and properly a sacrament instituted by Christ the Lord; or, that it is a certain human figment devised by men unskilled in ecclesiastical matters; or, that it is only a certain kind for choosing ministers of the word of God and of the sacraments; let him be anathema. –CANON IV. If any one shall say, that, by sacred ordination the Holy Ghost is not given; and that the bishops do therefore vainly say, Receive ye the Holy Ghost; or, that a character is not thereby imprinted; or, that he who has once been a priest, can again be a layman; let him be anathema. –CANON V. If any one shall say, that the sacred unction which the Church makes use of in holy ordination, is not only not required, but is to be despised and is pernicious, as likewise the other ceremonies of Order; let him be anathema. –CANON VI. If any one shall say, that, in the Catholic Church there is not a hierarchy instituted by divine ordination, consisting of bishops, priests, and ministers; let him be anathema. –CANON VII. If any one shall say, that bishops are not superior to priests; or, that they have not the power of confirming and ordaining; or, that the power which they possess is common to them with the priests; or, that orders, conferred by them, with the consent or vocation of the people, or of the secular power, are invalid; or, that those who have neither been rightly ordained, nor sent, by ecclesiastical and canonical power, but come from elsewhere, are lawful ministers of the word and of the sacraments; let him be anathema. CANON VIII. If any one shall say, that the bishops, who are assumed by authority of the Roman Pontiff, are not legitimate and true bishops, but a human figment; let him be anathema. And the bishops shall carefully teach this; that, by means of the histories of the mysteries of our Redemption, depicted by paintings or other representations, the people are instructed , and strengthened in remembering, and continually reflecting on the articles of faith; as also that great profit is derived from all sacred images, not only because the people are thereby admonished of the benefit gifts which have been bestowed upon them by Christ, but also because the miracles of God through the means of the saints, and their salutary examples, are set before the eyes of the faithful; that so for those things they may give God thanks; may order their own life and manners in imitation of the saints; and may be excited to adore and love God, and to cultivate piety. But if any one shall teach-or-think contrary to these decrees; let him be anathema. Whereas the power of conferring indulgences was granted by Christ to the Church; and she has, even in the most ancient times, used the said power, delivered unto her of God; the sacred and holy synod teaches and enjoins, that the use of indulgences , most salutary for the Christian people, and approved of by the authority of sacred councils, is to be retained in the Church; and it condemns with anathema those who either assert that they are useless, or who deny that there is in the Church the power of granting them. In granting them, however, it desires that, according to the ancient and approved custom in the Church, moderation be observed, lest, by excessive facility, ecclesiastical discipline be enervated. So great has been the calamitousness of these times, and the inverate malice of the heretics, that there has been nothing ever so clear in the statement of our faith, or so surely settled, which they, at the persuasion of the enemy of the human race, have not defiled by some sort of error. For which cause the holy synod hath taken especial care to condemn and anathematize the principal errors of the heretics of our time, and to deliver and teach the true and Catholic doctrine; even as it has condemned, anathematized, and defined. And whereas so many bishops, summoned from the various provinces of the Christian world, cannot be absent for so long a time without great casting away of the flock committed to them, and without universal danger; and whereas no hope remains that the heretics, after having been so often invited, even with the public faith which they desired, and so long expected , will come hither later; and as it is therefore necessary to put an end at length to the sacred council: it now remains for it to admonish in the Lord all princes, as it hereby does, so to afford their assistance as not to permit the things which it has decreed to be corrupted or violated by heretics; but that they be by them and all others devoutly received and faithfully observed. Cardinal. Anathema to all heretics. Pius, Bishop, servant of the servants of God, for the perpetual memory hereof. 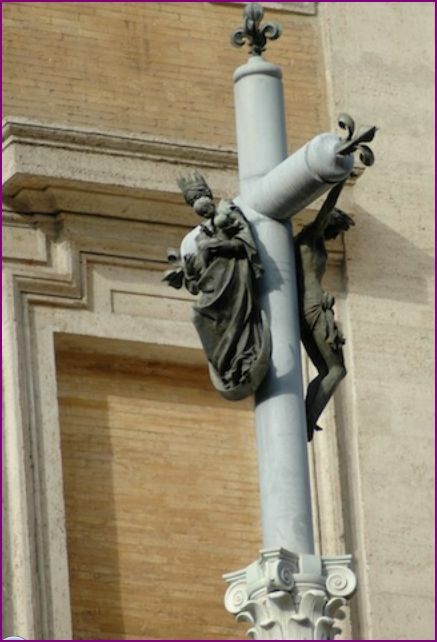 …I recognize the Holy Catholic and Apostolic Roman Church as the mother and mistress of all churches; and I promise and swear true obedience to the Roman pontiff, successor of St. Peter, prince of the apostles, and vicar of Jesus Christ. All other things also delivered, defined, and declared by the sacred canons and ecumenical councils , and particularly by the holy Synod of Trent, I undoubtingly receive and profess, and at the same time all things contrary, and any heresies soever condemned by the church, and rejected and anathematized, I, in like manner, condemn, reject, and anathematize. This true Catholic faith, outside of which no one can be saved, which at present I readily profess and truly hold, I, N. (the person’s name) promise, vow, and swear, that I will most steadfastly retain and confess the same entire and undefiled to the last breath of life (with God’s help), and that I will take care, as far as shall be in my power, that it be held, taught, and preached by my subjects, or those whose charge shall devolve on me in virtue of my office. So help me God, and these holy gospels of God. “After Her resurrection, she returns to the Middle World (where she first came at Her birthtime of Nativity) and takes up Her full royalty as Princess of the World. This is celebrated on the Day of Our Sovereign Lady (Culverine 5th/March 25th). “August 15th was originally the Assumption of the Holy Sophia” celebrated in paganism. And as you can see from the painting below, the Assumption of Mary, body and soul into heaven, was not always taught. The most Blessed Virgin Mary was, from the first moment of her conception, by a singular grace and privilege of almighty God and by virtue of the merits of Jesus Christ, Saviour of the human race, preserved immune from all stain of original sin. (Pius IX Ineffabilis Deus 1854; DS 2803). Those are only the main ‘feast days’ of Mary. There are many more days throughout the year devoted to Mary, some focusing on her alleged appearances throughout the world. These are only a few of many other Marian feast days: February 11th — Our Lady of Lourdes, May 13th — Our Lady of Fatima, August 22nd — Queenship of Mary, October 7th — Our Lady of the Rosary, December 12th — Our Lady of Guadalupe. DOES THE CATHOLIC CHURCH WORSHIP MARY, OR HONOR HER? PARA 967 By her complete adherence to the Father’s will, to his Son’s redemptive work, and to every prompting of the Holy Spirit, the Virgin Mary is the Church’s model of faith and charity. Thus she is a preeminent and …wholly unique member of the Church” ; indeed, she is the “exemplary realization” (typus) (508) of the Church. 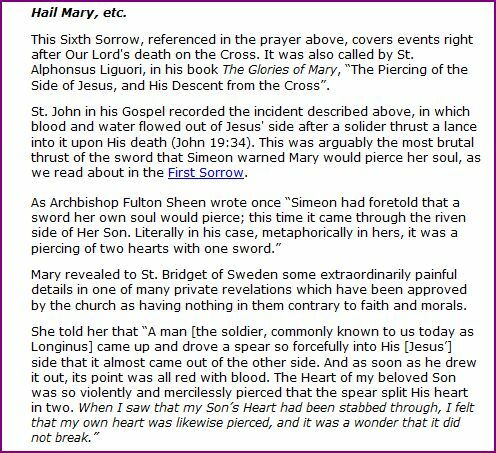 The picture below clearly reveals how Catholicism portrays Mary; that she participated in Christ’s suffering and therefore shared in the atoning work of Christ. This is pure blasphemy because it robs Jesus Christ from His complete atoning work that alone satisfied the full wrath of God that He has towards us because of our sins! Above picture captured from David Cloud’s video entitled, ‘CATHOLICISM, PAST AND PRESENT’ on YouTube. And as you can see below, the present pope, Pope Francis, is also continuing in this spiritual adultery. 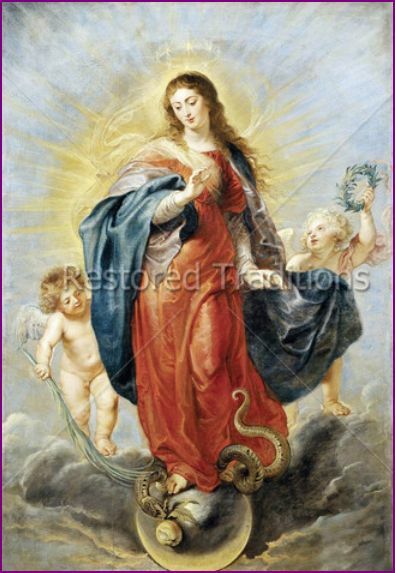 And, as you can see in the picture below, it is Mary who is shown to be the one who is crushing the serpent’s head! I think at this point I’ve shared enough information with you so that hopefully you now realize that Catholicism indeed places much more emphasis on Mary than they do on Jesus. 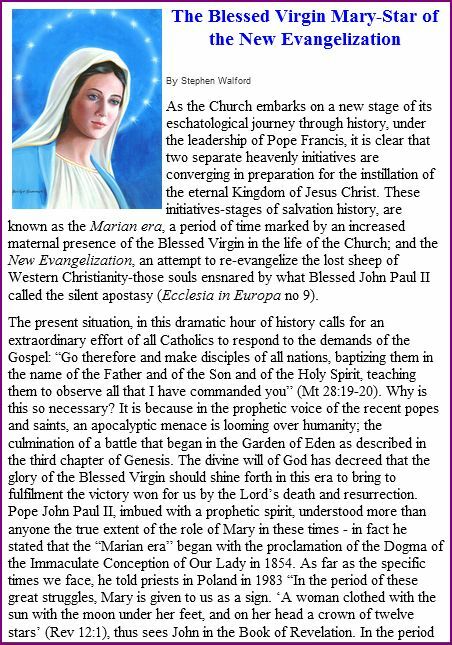 So now let’s get our focus where it belongs –on the Word of God–and let’s examine the Scriptures to see if what we have learned about Mary from Catholic teachings thus far lines up with what God’s Word has to say concerning Mary. Yes, Mary was blessed among women because she was chosen to be the mother of Jesus, but does Scripture indicate in any way that we are to come to Mary, and that Mary is to be worshiped? How did Jesus act when He was with Mary? Observe what takes place in the following verses, and carefully read all the rest of the verses and you will see that Scripture does not indicate in any way that Mary should be given the titles of Advocate, Helper, Benefactress, and Mediatrix. 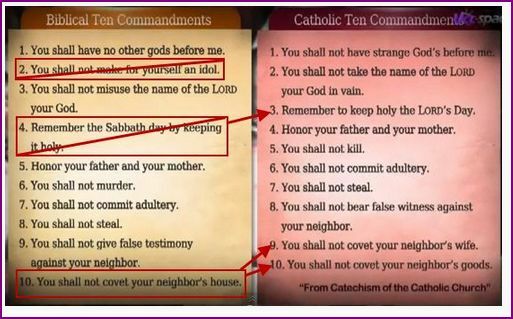 These are titles that apply to Jesus Christ and the Holy Spirit, yet the Catholic church is attempting to give these titles to her, and supposedly at her request! And, by God’s grace alone, from that point on I decided in my heart that even though God was able to bring my ‘husband’ to repentance and bring him home again, even if He doesn’t, I would choose to love Him and serve Him for the rest of my life simply because He paid the full price for my sins and revealed the true gospel and His love to me and He set me free from sin, shame, and guilt, and gave me a peace beyond all human understanding. If I could have everything this world has to offer if I chose to reject God’s love and forgiveness, it wouldn’t cause me to consider changing my mind not even for a second! In September of 1999 my ‘husband’ told my son that he wanted us to get our home ready to sell. That’s how I found out! Not from him, but through our son. Fear tried to take hold of me, but I chose to cling to God for my strength and peace. Then my dad died on October 31st 1999. The devastation in my life was mounting, but God’s grace was proving to be sufficient, and His peace went beyond all human understanding. “…perhaps it is time for us to begin actions aimed toward the resolution of our relationship. While this is certainly not a pleasant subject, it is something that needs to be addressed so that we may be able to determine a reasonable and equitable distribution of our assets, and proceed with our lives. His signature was typed and written above it, as well, in the usual business letter style. First I just want to express my deep appreciation to you for paying all the bills throughout all these years, and saying that you would continue until the house is sold. However, I had always hoped that the time would come when you would be truly sorry for walking out on me, Penny, and Peter. I thought that you would one day desire to make things work between us instead of allowing our home to be sold and wanting our marriage to end. “…the reality of seeing it, [the letter] and the coldness of the business-like form that you chose, caused me to cry from the depths of my heart. Horace, it doesn’t have to end this way. In the first paragraph of your letter, you wrote, “…perhaps it is time for us to begin actions aimed toward the resolution of our relationship.” You do have another choice; it could also be time to take steps aimed towards the restoration of our relationship and marriage. The choice is up to you…if you want to end what could be a wonderful marriage, after sorrow is expressed, and trust is once earned, that choice is in your hands alone to make. As I said to you in the past, I made a vow before God to love you forever, and I will not break it. If you want a divorce you will have to be the one to file. I can never force you to love me, but I will not be the one to begin the process of ending our marriage. My faith was now being put to the ultimate test! Even then I still continued to pray for a miracle, but after an extremely long and painful 2 1/2 year divorce process, on January 31, 2003 the judge declared that our marriage was dissolved. Because of my love and commitment to you, and to the God of the Bible — the God of Abraham, Issac, and Jacob — and to the Savior He provided for us — Jesus Christ — I never “gave up the faith”…in Him, or in the fact that through receiving His love and forgiveness, our marriage could be restored. Even though I had Biblical grounds for divorce, I chose to forgive you, to remain faithful to you, to wait, and hope, and not file for divorce. In spite of all the hurt and rejection I have felt, I still have a love for you, but I now release you, knowing I cannot make you love me. I do not regret waiting for you all these 18 years, for through it all I have learned what is means to truly love and forgive, and I have come to know the reality of God’s love and faithfulness to me. When the court proceedings finally ended that day and everyone was walking out, with God’s peace and courage in my heart, I walked up to Horace and calmly said, “Good-bye, Horace,” but he didn’t even look at me or say anything to me at all. God had abundantly given me His peace and His grace that was sufficient to carry me through that day! And even though I was very sad when I realized our marriage was actually over, I was finally at peace because I no longer had to deal with all of his lies, deceptive ways, and manipulation tactics. The only tears I shed that day were tears that came trickling down my cheeks out of a deep sadness that came over me when I removed my wedding rings that night. I felt as if I was removing a literal part of me, and, in a sense, I guess I was. So many more painful things happened throughout our ‘marriage,’ but it really isn’t necessary for me to share all the dirty details with you. Lord willing, I plan on sharing a little more of what I went through in the book I am in the process of writing, but I tried to just give you a short version (believe it or not) of my testimony here. In spite of the fact that my hopes and dreams had been shattered, in the end I came to know God’s love and faithfulness in an even deeper way –especially through those last 2 1/2 years! Even though there were definitely short periods of time through all those years when I was angry at God, when it was all said and done, instead of being angry at God and losing my faith, my faith grew even stronger! In spite of the fact that I fought against going through the many trials that came my way at the start of many of those trials, I came to welcome the testing of my faith throughout all those years because I wanted to show God that, in spite of all the circumstances, I loved Him for all He had done for me to make me His own. Jesus, as revealed in God’s Word, is the risen Savior who is now seated in heaven at the right side of the Father and lives to intercede on our behalf before the Father. (Romans 8:34, Hebrews 7:23-25) The Jesus of Catholicism, however, is shown as still hanging on the cross and is presented to Catholics as the Eucharistic Jesus; a wafer worshiped when on display in an elaborately decorated monstrance and placed on altars around the world, and who is called down from heaven continually during the ‘sacrifice of the mass’ that takes place countless numbers of times in Catholic churches worldwide. Catholicism makes the claim that they are the only ones who have the “real presence” of Jesus by their teaching that the bread and wine actually becomes transformed into the body and blood, soul and divinity of Jesus, (by the process known as ‘transubstantiation’) thus luring many Protestants into Catholicism because they seek to “experience God” and fail to truly test teachings like that in light of Scripture. I was angry at the Roman Catholic system because their teachings blind the minds of their people — including my dear father — from seeing Biblical truth because they make their people dependent from birth until death on the Church to save them, instead of teaching the sufficiency of Jesus’ death as full payment for sin and trusting Christ alone for salvation as revealed in God’s Word! Therefore, even though I was angry at God for a brief moment because my dad seemed to have died without assurance of salvation, the fact still remained that the gospel, as revealed in His Word, was true! So from that point on I was even more determined to do all that I could do in order to reach my family and all Catholics with the truth that is so clearly revealed in their Bibles so that they might come to the knowledge of the true gospel and live and die with assurance of eternal life and not die without hope! I still continue to hold on to hope that in those final seconds before my dad actually died that God was faithful to bring the truth of His Word to his mind, and that he embraced the joyful truth that Jesus Christ paid the debt for all of his sins in full! I have already seen how God has used this trial to bring glory Him; it’s easy to live for God when things are going well, but people watch how we as Christians respond to tragedies to see if we continue to live for Him when our world turns completely upside down, and my family has seen me go through a lot over the years! During a recent conversation with my mom she made a comment on how strong my faith has been with all I have gone through and continue to go through, which then gave me another opportunity to share about Jesus with her and how He gives a peace that is real and surpasses all human understanding, and I also used it as an opportunity to share the gospel with her again. If God can use what I am going through as a way to share the gospel with my family and others, then I consider this trial to be a blessing! Lord willing, I’m considering writing about this physical trial in greater detail in the future hoping that I might be an encouragement to others who may be going through something similar, so be watching for that sometime in the Spring of 2015. (UPDATE: Lord willing, make that the Spring of 2016). Now, since I lost my job of thirteen years at the end of October of 2013 (due to the previously mentioned health issue, though no one in management will admit to that) I am looking for a job as a Christian writer and will be signing up on a website called ‘Faithwriters’ trusting that if this is God’s will for me, that one day this will happen. (UPDATE: I now have a part-time job and decided not to sign up on Faithwriters, but to just continue writing on my blog when time allows. If God desires me to have a job as a Christian writer, He will bring it to pass in His way and in His timing, so that He will receive all the glory). I am also trying to serve my mom and to show her that I love her and that she has worth and value by helping take care of her as she is trying to regain her ability to walk again after an injury in March of 2014, as well as suffering from a bad case of the Shingles at the same time, and breaking her leg in March of 2015. I can now see God’s ‘hand’ in all of this, and came to realize that it was His will for me to no longer have my job so that I would be available to help and to encourage my mom at this difficult time in her life. 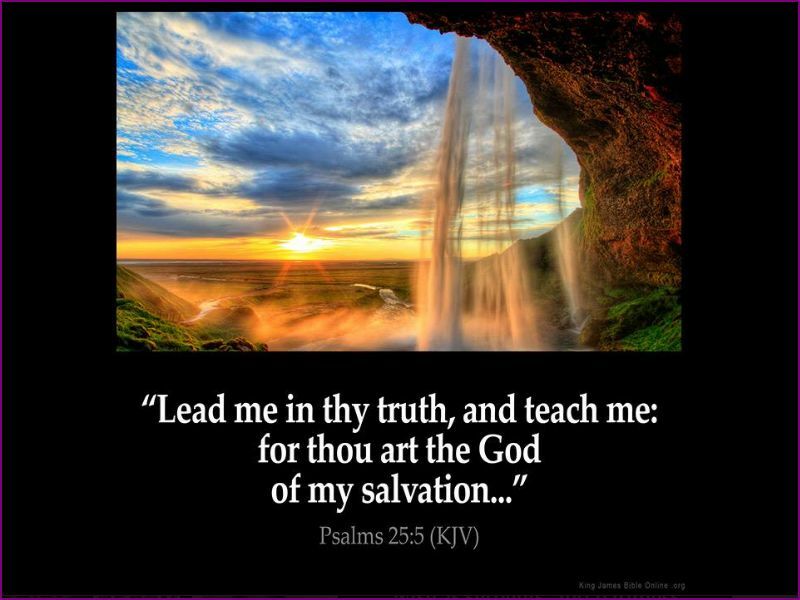 Religion and the traditions and philosophies of men can blind people from seeing Biblical truth, (Mark 7:13, Colossians 2:8) but the gospel is the power of God unto salvation. (Romans 1:16) People can be very religious and very sincere, but they can be sincerely wrong and lost for all eternity if they do not come to God through Jesus Christ and place their trust in Him alone instead of depending on their good works or their religion to save them. Dear Catholics, (or whatever religion you may be a part of) may I please ask you to sit down with your Bible and pray for God to show you what the truth is? In the days and weeks to come, please just take fifteen or twenty minutes every day and read through the book of Romans, Hebrews, and the gospel of John and test all you have learned over your many years of religious training against God’s Word and see what you discover. ‘ARE YOU GOING TO BELIEVE THE WORD OF GOD…OR THE WORD OF MAN?’ — A COMPARISON OF GOD’S WORD, THE BIBLE, WITH THE CATECHISM OF THE CATHOLIC CHURCH’ (UPDATE 8/10/15 I am still reading through the entire Catechism of the Catholic Church book which is over 700 pages long, and I am not quite sure when this post will actually be written, but I will update you when it is close to being completed). Thank you for stopping by. And thank you very much for taking time out of your busy day to read some of my posts and poems. And to those of you who actually read this extremely long post, an extra big thank you goes out to you! I’m sure that many of you who are Christians can identify with the feeling of being ‘worn’ by the circumstances that life continues to bring, in spite of a deep and abiding faith in Christ and belief in His Sovereignty. This poem sums up what I have been ‘feeling’ over the past few months, but we as Christians must not be led or controlled by our feelings. If we have repented (turned from sin because of sincere sorrow in our hearts – 2 Corinthians 7:10) and have placed our complete trust in Christ providing full payment for our sins and satisfying God’s wrath that He has towards us because of our sins, and have submitted our lives to Him, then we must choose to trust Him and respond in the midst of trials in a way that seeks to honor and glorify God, and not in a way that satisfies our human sinful nature. And, as those of us who are truly Christians know — as hard as we may try, in our own strength that is not always possible. At times we may still try and take matters into our own hands and react in the flesh, instead of responding with self-control and relying upon God’s strength and out of a desire to glorify God. God bless you, and thank you for stopping by. And thank you to those of you who take the time to read my posts and poems. I pray that somehow God will bless and encourage you through what I write. Above all, I pray God will reveal His truth to you and encourage you through the Scriptures I continue to post with each blog post I write.